Bronze Fennel or’foeniculum vulgare purpureum, ‘ Florence Fennel or ‘foeniculum vulgare dulce’ and Sweet Fennel ‘Foeniculum vulgare var. azoricum’ are the three most popular species grown. 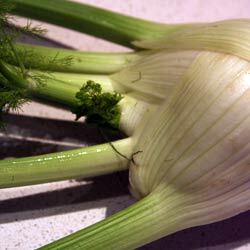 They are grown for the large base of the stalk which is cooked or for the seeds which are use in cooking, Fennel can easily be grown from seed even easy from seedling plants. This is a plant that is grown both as a herb and a vegetable. The Bulb (picture right) is used for roasting, as a mash and in soups. Growing from seed is the easy option, and you can buy it at most good garden centres. You will need a sunny position and a good humus rich soil, dig in lots of well rotted manure and compost before planting. We are after big healthy bulbs so a well dug rich soil will provide the right conditions for growth. Sow seed directly into the ground. A humus rich moist soil is best. 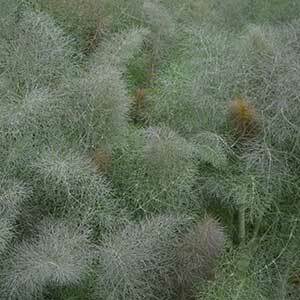 Fennel can be planted in Autumn or spring. Plants are usually grown from seeds as seedlings are difficult to come by, the variety that you are looking for is ‘Florence ‘ not the wild plant that grow along railway lines and is other areas. Seeds can be sown from August to September depending on climate. It is always best to make sure that you do not allow plants to self seed unless you want to collect the seed, or you might find you have a few to many plants. Wait until the the bulb gets to a good size, but not until the seed heads start to form, this is usually in early autumn. From seed to harvest takes around 3 months.